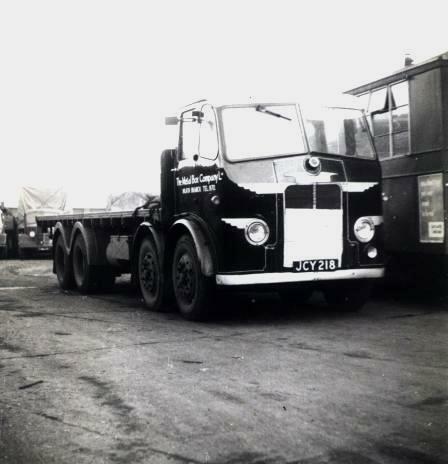 They were some of the great movers of the 20th Century carrying steel, coal and general goods, these were the haulage contractors of Wales captured on photos to create a living gallery of Welsh lorries. We welcome your photos for this new sectio, black and white or coloured. We will also welcome your donation of old photo collections, they will go into the archives and we will copy all to CD�s and send you copies of these. A trusty Leyland Octopus JCY218 from the fleet of The Metal Box Co, Eaglesbush Tinplate Works, Neath is seen here at an unknown location. Note the Bedford "you see them everwhere" OSS tractor and trailer in the background suggesting this was in fact not at Eaglesbush Tinplate Works.